Background: Palliative care is an approach that has been used to care for terminally ill patients. The current study was performed to assess the association between the status of patient dignity and quality of life (QOL) in Iranian terminally ill patients with cancer. Materials and Methods: This descriptive correlational study was conducted on 210 end-stage cancer patients (102 men and 108 women) who were referred to Seyed Al-Shohada Hospital, Isfahan, Iran, in 2015. To assess dignity status, we used the Patient Dignity Inventory. The Persian version of the European Organization for Research and Treatment of Cancer Quality of Life Questionnaire was used for QOL assessment. Results: There was a significant negative association between total dignity status and QOL scales. In addition, significant negative relationship was observed between dignity-related domains (loss of worth sense: r = −0.50, P< 0.001; anxiety and uncertainty: r = −0.51, P< 0.001; symptom distress: r = −0.62, P< 0.001; and loss of autonomy: r = −0.61, P< 0.001) and functional scale and some subscales of the QOL scale. In contrast, a significant positive relationship was found between dignity-related domains, and total symptom scale and fatigue. No significant relationship was observed between different items of dignity and global health status/QOL scale. Conclusions: High dignity status in terminally ill patients was associated with higher QOL in terms of functional intactness and lower symptom distress. Further studies are necessary to shed light to our findings. Cancer has been the second leading cause of mortality in the past century, and thus, is of grave importance. In Iran, cancer is the third main cause of death only after cardiovascular diseases (CVD) and accidents. Local reports indicate that the incidence of cancers will further increase in Iran. For example, a recent estimation indicated that the incidence rate of most common cancers including lung, stomach, breast, and prostate will increase over the period of 2001–2015 in Isfahan Province in the centre of Iran. Palliative care has been used for patients with advanced stages of cancer. In palliative care, it has been shown that dignity conveys an inherent respect for terminally ill patients as they prepare for death., Dignity is defined as the quality or state of being worthy, honored, or esteemed. Loss of dignity has been reported as one of the most important reasons that terminally ill individuals request euthanasia or assisted suicide., Chochinov et al. reported that dignity therapy in patients with advanced stages of disease improved QOL, increased their sense of dignity, and changed how their family saw and appreciated them. Other studies have shown that dignity in terminally ill patients is positively associated with QOL, including physical, mental, functional, social, and emotional health., Some studies have not shown an association between the sense of dignity in terminally ill patients and QOL scales., Therefore, data on the association between dignity and QOL is inconsistent, scarce, and limited to western countries. In Iran, some studies have reported that patients with end-stage cancer have a low sense of dignity. 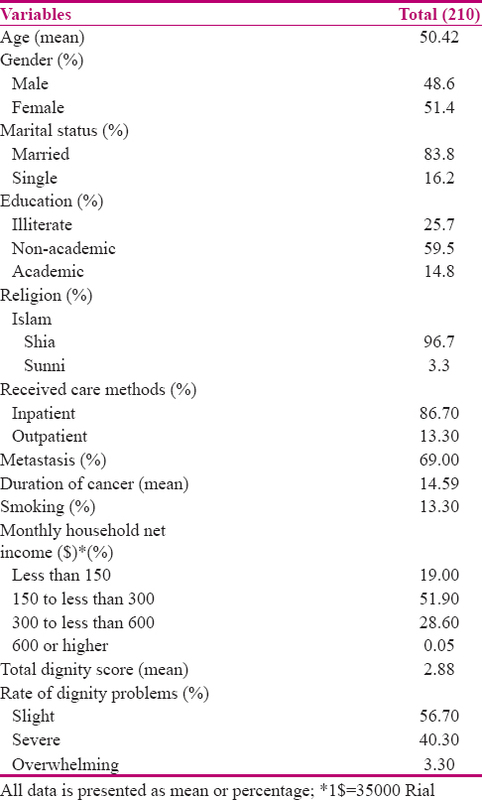 Studies performed in Iran have examined some aspects (not all) of QOL scales in relation with the sense of dignity but this relationship has not been fully assessed., Moreover, evidence suggests that dying patients cared for within the Iranian health care system, in spite of cultural and religious differences, have similar problems as those in other countries. Based on previous studies, culture can affect the sense of dignity in terminally ill patients because it helps define psychological status and create meaningful clusters of behavior according to particular logics. The current study, therefore, aimed to assess the association between dignity status and QOL in Iranian terminally ill patients with cancer. This descriptive correlational study was performed on patients with end-stage cancer in the age range of 15 to 85 years. Based on a type I error of α = 0.05, a power of 80%, and at least 0.2 estimate of correlation coefficient between dignity and QOL, a sample size of 210 participants was determined. During 4 months, 255 patients who fulfilled the study inclusion criteria were chosen. From among the 255 patients identified as candidates, 12 patients were discharged before the interview could take place and 18 were unable to complete the questionnaire and consent form due to severe physical symptoms. Of the remaining 225 patients, 15 were unwilling to participate in the study. Thus, 210 terminally ill patients with cancer (93.33%) completed the questionnaires. All cancer patients were selected from the Seyed Al-Shohada Hospital affiliated with the Isfahan University of Medical Sciences, Isfahan, Iran, between November 2014 and March 2015. This hospital is a teaching and referral oncology center that covers a varied number of patients from several provinces in Iran, particularly Isfahan, Chaharmahal and Bakhtiari, Kohgiluyeh and Boyer-Ahmad, and Lurestan. This hospital also provides palliative and end-of-life care services for dying and end-stage patients. The study inclusion criteria included being 15 years of age or older, diagnosis of terminal cancer with a life expectancy of less than 6 months, performance status of more than 2 based on the Eastern Cooperative Oncology Group (ECOG) performance status, ability to read and speak Persian, and no evidence of dementia or delirium (by reviewing the medical records). The exclusion criteria included visual and hearing problems, inability to give informed consent, being critically ill, and unable to take part in the study protocol. Other data on age, gender, education (illiterate, under diploma, diploma, academic), monthly household net income, marital status, smoking status, and alcohol consumption was collected through direct interviews using a questionnaire. In addition, we obtained information about the duration of cancer and metastasis by assessment of patients' records. The Patients Dignity Inventory (PDI) was applied to assess the dignity-related distress of each patient. This questionnaire contains 25 items scored on a five-point scale (1 = not a problem; 2 = a slight problem; 3 = a problem; 4 = a major problem; 5 = an overwhelming problem). This questionnaire is divided into 4 domains including symptom distress, anxiety and uncertainty, loss of autonomy, and loss of sense of worth raised in association with a patient's sense of dignity. Mean dignity-related distress domain scores were calculated. Participants' responses were also categorized as a slight problem (item score of 1 to less than 3), a severe problem (item score of 3 to less than 5), and an overwhelming problem (item score of 5). Permission to use the PDI was obtained from the original author. The PDI was directly translated into Persian by professors of Isfahan University of Medical Sciences who were fluent in English. Then, it was translated back into English by another professor fluent in English. Subsequently, it was compared with the original Persian translation and was accepted. Subsequently, the translations were compared, matched, and given to a group of professors and experts in the field of cancer and psychology to comment on the content validity of the questionnaire. Modifications were applied, after receiving the opinion of the experts. The final version of the Persian questionnaire had no ambiguities, and was simple and understandable for the target group. To determine its reliability prior to the current study, 30 patients with advanced-stage cancer completed the PDI questionnaire and Cronbach's alpha coefficient was calculated (α = 0.90). PDI questionnaires were completed as self-report questionnaires, but when required, a highly skilled nurse read the questions aloud and recorded the responses. The Persian version of the European Organization for Research and Treatment of Cancer Quality of Life Questionnaire (EORTC QLQ-C30) was used for QOL assessment. This 30-item questionnaire consists of a functional scale (physical, role, emotional cognitive, and social functioning), symptom scale (fatigue, nausea, and pain), 6 single items (dyspnea, sleep disturbances, appetite loss, constipation, diarrhea, and the financial impact of the disease and treatment), and a single global QOL scale. Each item is rated on a four-point scale (1 = not at all, 2 = a few, 3 = a lot, 4 = so much). We converted the score of each scale to range from 0 to 100. A high score for the functional scale represents a high level of functionality and a high score for the global QOL scale represents high QOL, however, a high score for the symptom scale represents a high level of distress or symptomatology. The validity and reliability of this questionnaire were previously determined by Montazeri et al. All analyses were performed using the Statistical Package for the Social Sciences software (version 19.0, SPSS Inc., Chicago, IL, USA). Quantitative variables are expressed as mean and standard deviation, and qualitative variables are shown as frequencies (percentages). To determine the differences in qualitative and quantitative variables among categories of dignity scores, we applied one-way analysis of variance (ANOVA). In addition, we compared qualitative and quantitative variables among categories using Chi-square and independent sample t-test, respectively. The Pearson correlation was used to examine the association between dignity scores and different QOL scales. All P values of less than 0.05 were considered significant. This study was approved by the Ethics Committee of Isfahan University of Medical Sciences and written informed consents were obtained from all participants. [Table 2] presents the association between dignity domains and different QOL scales. 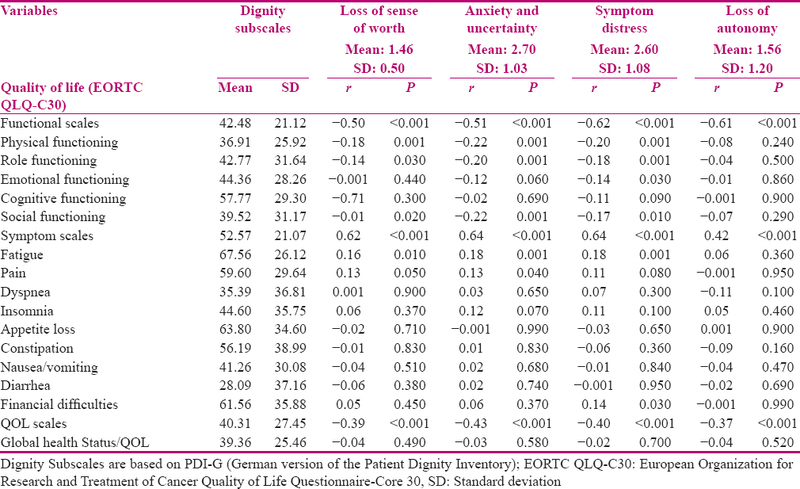 Dignity domains including the loss of sense of worth (r = −0.50, P < 0.001), anxiety and uncertainty (r = −0.51, P < 0.001), symptom distress and body image (r = −0.62, P < 0.001), and loss of autonomy (r = −0.61, P < 0.001) were negatively associated with total score of the functional scale. Moreover, this relationship was significant for loss of sense of worth, anxiety and uncertainty, and symptom distress in relation with functional subscales including physical, role, and social functioning, but not for loss of autonomy. Emotional functioning was negatively associated with symptom distress and body image (r = 0.14, P = 0.030), but not with other dignity items. No significant association was observed between different dignity domains and cognitive functioning. There was a significant positive association between different items of dignity and total scores of symptom scales (loss of sense of worth: r = 0.62, P < 0.001; anxiety and uncertainty: r = 0.64, P < 0.001; symptom distress and body image: r = 0.64, P < 0.001; and loss of autonomy: r = 0.42, P < 0.001). Furthermore, this significant association was observed between fatigue item and symptom scales, except sense of loss of autonomy. There was a significant positive relationship between sense of anxiety and uncertainty, and pain. There was no significant association between different domains of dignity and other symptom subscales, except for financial difficulties that was positively associated with symptom distress. Total score of QOL scale in this study was also associated with all dignity domains; however, global health status/QOL scale was not significantly associated with these domains. The objective of the current study was to assess the association between dignity status and QOL in Iranian patients with advanced-stage cancer. Based on our findings, the majority of patients in our study reported a slight sense of dignity problem (56.7%). However, fewer patients reported severe (40.3%) and overwhelming (3.3%) dignity-related issues. The reason for having severe dignity problems might be that patients who participated in the study received less than optimum end-of-life and palliative care services. In this cancer center, communication and interactions may not be sufficient between nurses (and other health care providers), patients, and their caregivers. This might be due to the shortage of nurses; the ratio is almost 5 patients to 1 nurse. To conclude, the absence of a coherent and advanced palliative care and the shortage of nurses trained in palliative care in this center should be taken into consideration. It was found that hospitalized patients' encounters with a variety of different shortages lead to feelings of low self-worth and dignity, which was in agreement with the findings of Ebrahimi et al. In addition, findings of this study revealed a significant negative association between scales of dignity and functional QOL scale. In line with our findings, Sautier et al. reported a significant negative association between role, physical, and social functioning of QOL with scales of dignity. Moreover, Vehling and Mehnert reported that patients with high functional problems had low sense of dignity to the extent that was of great concern. Therefore, attention to dignity can promote functioning in end-of-life patients, and this subject was also emphasized in prior studies. Religious counselors and psychologists may help in increasing the sense of dignity as well as the functional scale of QOL score in terminally ill patients. Montross et al. reported that dignity therapy is a valuable and effective method for reduction of pain in dying patients and patients are willing to recommend this method to others. Based on our findings, no significant association was found between functional subscales of QOL and loss of autonomy. Moreover, cognitive functioning of QOL was not significantly associated with scales of dignity. In contrast with our findings, another study showed that patients with high scores in the functional scale of QOL had a low sense of loss of autonomy. Another study reported a significant negative association between cognitive scale of QOL and different scales of dignity. Different results in previous studies can be due to differences among patients in terms of culture and social factors, available equipment, and type of end-of-life care or treatment. For example, patients in current studies received no palliative care, while this type of care was prescribed in the study by Sautier et al. In the current study, a significant positive association was found between total score of symptom scales (and also financial difficulties, fatigue, and pain) and dignity scales; patients with severe disease symptoms had a low dignity status score. Our findings were confirmed by two studies, which reported that fatigue, pain, and other disease symptoms were positively associated with scales of dignity., The sense of dignity in patients with end-stage cancer was affected by loss of sense of worth, sense of dependency on others, and lack of respect from family and care personnel, sense of control in life, and support from society, medical staff, and relatives, and change in the view of others toward them. These findings were supported by previous studies that reported that the sense of dependency, loss of worth, cosmetic changes, and loss of control in life decreased the sense of dignity in terminally ill patients. Similarly, in the study by Chochinov et al., patients reported that some items of the dignity questionnaire including life without meaning (Q14), concern about the future (Q8), anxiety and depression (Q5,6), uncertainty of prognosis and treatment (Q7), and inability to perform daily activities (Q1) are the main problems that decrease their sense of dignity. The findings of the present study must be considered within its limitations. The first limitation is the cross-sectional nature of our study; hence, we cannot confer a causal link between dignity and QOL. Further, perhaps prospective studies are required to confirm our findings and establish causal pathways. The second limitation was that the current study only determined dignity status in terminally ill patients with cancer, but did not perform any interventions for this group of patients. It is suggested that future studies on dispelling dignity problems and feasibility of dignity therapy be conducted on end-of-life experiences of terminally ill patients. Given that the quality of palliative services patients received in this center was less than optimal, as recommended by Bahrami and Arbon, we also suggest that a study be conducted to compare QOL enhanced through a palliative care system with other patients' reported outcomes. In conclusion, a strong sense of dignity in terminally ill patients with cancer was associated with high QOL, both in the functional and symptoms scale. Therefore, interventions to increase the sense of dignity in terminally ill patients, especially those with cancer, can improve disease symptoms and functioning. Moreover, the training of nurses in this regard can help to increase the sense of dignity in terminally ill patients. In addition, the use of religious counselors and psychologists for these patients may help to increase their sense of dignity and QOL scales scores. On the other hand, further studies, especially those controlling all of the confounding variables, are necessary to shed light on our findings, given that enhancing dignity and improving QOL lies at the heart of providing comprehensive quality palliative care. This article was derived from a Master's thesis with project number 893680 affiliated with the Isfahan University of Medical Sciences, Isfahan, Iran. We appreciate the Clinical Research Development Center of Seyed-Al-Shohada hospital. We also appreciate the efforts of Dr. Harvey Max Chochinov who helped us in doing this study. Also, we want to thank Mr Mohsen Norouzi who helped us to collect data from end-stage patients in the hospital. Isfahan University Medical Science Grant No: 393680. Higginson IJ, Costantini M. Dying with cancer, living well with advanced cancer. Eur J Cancer 2008;44:1414-24. Mousavi SM, Gouya MM, Ramazani R, Davanlou M, Hajsadeghi N, Seddighi Z. Cancer incidence and mortality in Iran. Ann Oncol 2009;20:556-63. Moradpour F, Fatemi Z. Estimation of the projections of the incidence rates, mortality and prevalence due to common cancer site in Isfahan, Iran. Asian Pac J Cancer Prev 2013;14:3581-5. Bahrami M. Meanings and aspects of Quality of Life (QoL) for cancer patients: A descriptive exploratory qualitative study. Contemp Nurse 2011;39:75-84. Bahrami M. Why differences exist? an interpretive approach to nurses' perceptions of cancer patients' quality of life. Iran J Nurs Midwifery Res 2011;16:117-24. Alexander K1, Goldberg J. Palliative care and symptom management in older patients with cancer. Clin Geriatr Med 2016;32:45-62. Pearson EJ, Morris ME, McKinstry CE. Cancer-related fatigue: A survey of health practitioner knowledge and practice. Support Care Cancer 2015;23:3521-9. Vieira R, Goldim J. “Bioética e cuidados paliativos tomada de decisõ es e qualidade de vida” 2012;334-9. Muñiz M, Pérez C. Reflections about the ethical and bioethical problems in treatment presenting with a terminal disease. Rev Cubana Med Gen Integr 2009;25:98-106. Bahrami M, Balouchestani E, Amini A, Eghbali M. Assessing the effect of two praying methods on the life quality of patients suffering from cancer hospitalized at Seyedo Shohada medical center of Isfahan University of Medical Sciences, Iran. J Nurs Midwifery Res 2010;15:296-301. Bahrami M, Parker S, Blackman I. Patients' quality of life: A comparison of patient and nurse perceptions. Contemp Nurse 2008;29:67-79. Kade WJ. Death with dignity: A case study. Ann Int Med 2000;132:504-6. Sadeghi O, Maghsoudi Z, Askari Gh, Khorvash F, Feizi A. Association between serum levels of homocysteine with characteristics of migraine attacks in migraine with aura. J Res Med Sci 2014;19:1041-5. Parandeh A, Khaghanizade M. Nurses' human dignity in education and practice: An integrated literature review. Iran J Nurs Midwifery Res 2016;21:1-8. Ganzini L, Nelson HD, Schmidt TA, Kraemer DF, Delorit MA, Lee MA. Physicians' experiences with the Oregon Death with Dignity Act. N Engl J Med 2000;342:557-63. Sullivan AD. Physician-assisted suicide in Oregon: The second year. N Engl J Med 2000;342:598-604. Chochinov HM, Kristjanson LJ, Breitbart W, McClement S, Hack TF, Hassard T, et al. Effect of dignity therapy on distress and end-of-life experience in terminally ill patients: A randomised controlled trial. Lancet Oncol 2011;12:753-62. Chochinov HM, Hassard T, McClement S, Hack T, Kristjanson LJ, Harlos M, et al. The landscape of distress in the terminally ill. J Pain Symptom Manage 2009;38:641-9. Chochinov HM, Hack T, Hassard T, Kristjanson LJ, McClement S, Harlos M. Dignity in the terminally ill: A cross-sectional, cohort study. Lancet 2002;360:2026-30. Oosterveld-Vlug MG, Pasman HR, van Gennip IE, Willems DL, Onwuteaka-Philipsen BD. Nursing home staff's views on residents' dignity: A qualitative interview study. BMC Health Serv Res 2013;13:353. Freire ME, Sawada NO, de Franca IS, da Costa SF, Oliveira CD. Health-related quality of life among patients with advanced cancer: An integrative review. Rev Esc Enferm USP 2014;48:357-67. Leung AK, Cohen D. Within- and between-culture variation: Individual differences and the cultural logics of honor, face, and dignity cultures. J Pers Soc Psychol 2011;100:507-26. Chochinov HM, Hassard T, McClement S, Hack T, Kristjanson LJ, Harlos M, et al. The patient dignity inventory: A novel way of measuring dignity-related distress in palliative care. J Pain Symptom Manage 2008;36:559-71. Sautier LP, Vehling S, Mehnert A. Assessment of patients' dignity in cancer care: Preliminary psychometrics of the German version of the Patient Dignity Inventory (PDI-G). J Pain Symptom Manage 2014;47:181-8. Montazeri A, Harirchi I, Vahdani M, Khaleghi F, Jarvandi S, Ebrahimi M, et al. The European Organization for Research and Treatment of Cancer Quality of Life Questionnaire (EORTC QLQ-C30): Translation and validation study of the Iranian version. Support Care Cancer 1999;7:400-6. Adib-Hajbaghery M, Khamechian M, Alavi NM. Nurses' perception of occupational stress and its influencing factors: A qualitative study. Iran J Nurs Midwifery Res 2012;17:352-9. Vehling S, Mehnert A. Symptom burden, loss of dignity, and demoralization in patients with terminaly ill: A mediation model. Psychooncology 2014;23:283-90. Montross LP, Meier EA, De Cervantes-Monteith K, Vashistha V, Irwin SA. Hospice staff perspectives on Dignity Therapy. J Palliat Med 2013;16:1118-20. Chochinov HM, McClement SE, Hack TF, McKeen NA, Rach AM, Gagnon P, Sinclair S, et al. The Patient Dignity Inventory: Applications in the Oncology Setting. J Palliat Med 2012;15:998-1005. Bahrami M, Arbon P. How do nurses assess quality of life of cancer patients in oncology wards and palliative settings? Eur J Oncol Nurs 2012;16:212-9.